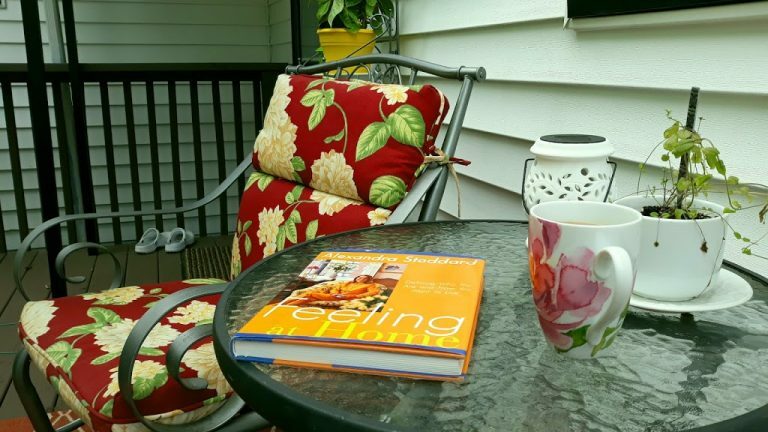 I’m sitting out on our back deck with my cup of coffee and a book. Obviously, I’m not reading my book, since I’m writing to you. But I’ve been neglecting my friendship with you, so here I am enjoying my back deck with you. I’ve been thinking about our old little house a lot. This is something that I couldn’t have done there. The outdoor spaces, although the yard was large for that neighborhood, was not pleasant to spend time in because there wasn’t really anywhere to relax. 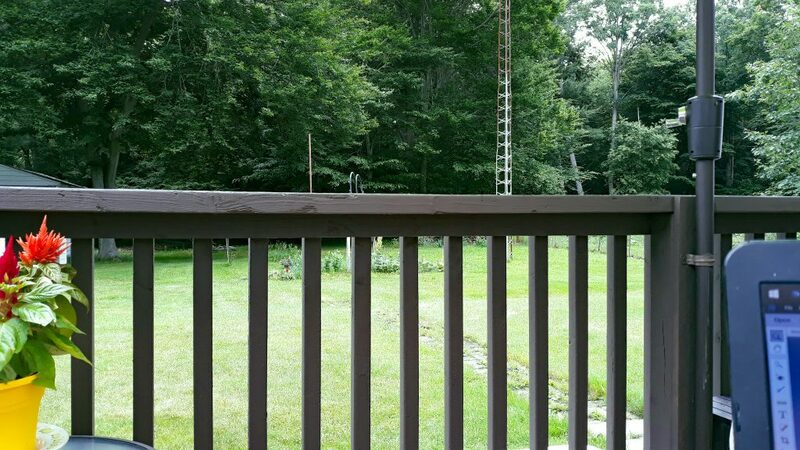 Here, we have a nice deck overlooking our nice green yard. It’s not a perfectly manicured yard. We have weeds that should be pulled, a path made with pavers that leads to nowhere, and a large ugly ham radio tower that will be removed in the next couple of weeks. The tower is the last remnant of the previous owner’s ham radio hobby. On the left is how it looked two years ago, and on the right is how it looks today. We’ve done a lot of work on the deck this year. We kind of put it off for the last couple of years because we were focusing on other things around the house. 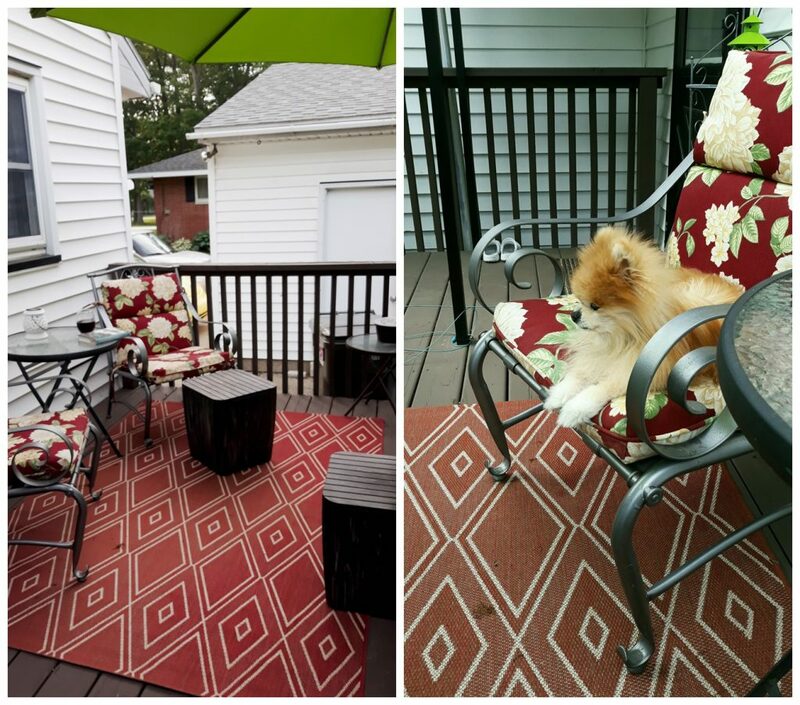 But this year, we decided it was time to tackle the deck, and it feels like a brand new space. 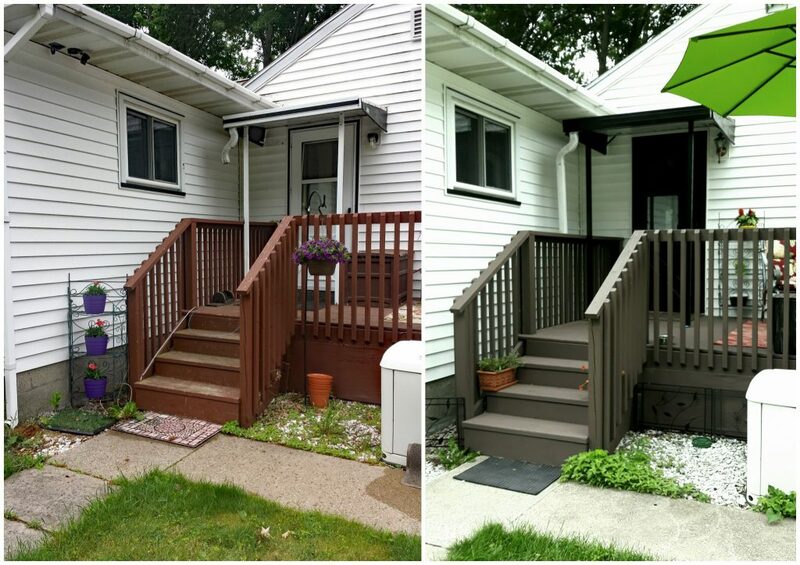 It’s amazing how a little scrubbing and a fresh coat of stain can make so much difference. The umbrella I bought also makes a huge difference. Jim added some brackets to one of the rail posts to put it in, and now we have a nice 9-foot market umbrella shading the deck most of the morning. Now I’m able to come out here and enjoy my morning coffee and a book with my feet up most of the morning without the hot sun beating down on me starting mid-morning. The storage boxes make putting our legs up and relaxing easier. Even Tia enjoys the deck. Jim enjoys the newly restored deck too, except he enjoys it in the evening after he gets out of work. I often join him out here because I miss him during the day. I’m not sure if he appreciates me horning in on his relaxation time, but he hasn’t said anything… yet. We have just one more project to do on the deck before we can call it finished. We want to put some 1×8 inch caps on top of the railing. We wanted something wide enough to set a drink on when you stand at the rail. 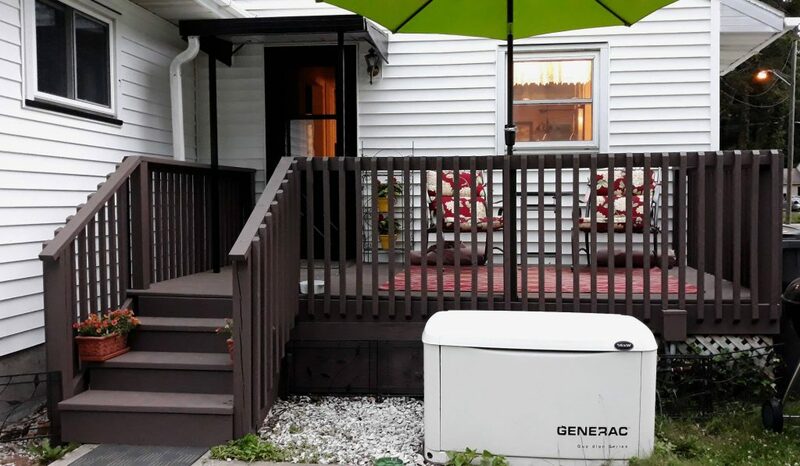 Our deck helps us feel at home. This house, our home, still makes me smile. I don’t know how to explain it, exactly. I think it’s something you really have to experience to understand. That warm feeling of complete belonging and contentment that you get when you live in a home you love. And I think it’s different for everyone, but when you experience it, you know you’ve found home. Some call it your happy place, but I call it where I can be myself. Have you found where you feel home?